" After receiving discouraging estimates from some major bath remodeling companies, I discovered Paul through a search on the Internet. After some research I saw that the type of work he turned out was consistent to the look I was trying to achieve with the remodel of my master bath. We met, Paul listened to what I was trying to achieve; he offered suggestions without trying to “sell up” or inflate the project and he turned out an estimate that was very reasonable for the project at hand. He works with very cost-effective suppliers that helped hold the cost of the remodel down. The end result is a beautifully remodeled master bath that met every expectation and requirement I had. It was done professionally, within the time estimate given (actually less time) and within budget. Couldn’t have asked for a better outcome, a more beautiful bathroom or for a nicer team working at my house. Thank you Paul for a tremendous job!
" I absolutely LOVE, LOVE, LOVE, my new bathroom. I can’t stop going in there and staring at it. My husband said it’s the most elegant room in the house, but now it does not go with the rest of the house (I see more remodeling in my future!!). Paul has a great eye for design. He offered us many options regarding patterns and materials. He suggested the linear shower drain as something “unique” and that became the focal point of our remodel. I am so happy that I spent the extra money for the drain; it looks so modern and fantastic. Prior to contacting Paul, I was envisioning a tinted brown glass shower door. When we went to the glass showroom, the staff there tried to talk us out of the tinted glass, saying that it would be too dark. I did not agree with them and I am so glad that I ordered the tinted bronze glass. It looks beautiful and it is not dark at all. Thank you to Paul Murphy and James (his tile guy, who has the best work ethic that I have ever seen). I would highly recommend the services of Murphy’s Bathroom Remodeling. " "After several quotes from local contractors, we decided to hire Paul Murphy and have never regretted the decision. Paul is a true professional, his quick on the spot quote and extra help with design and money saving ideas was much appreciated. Paul's estimating expertise is amazing. We couldn't rave more about his honesty, dependability and easy-going personality. 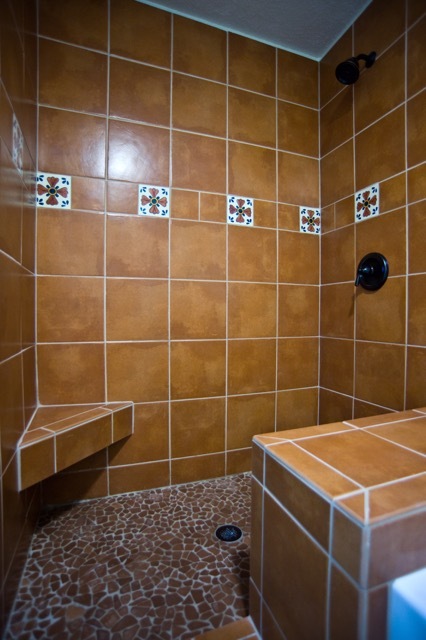 Our finished new shower is FAR better than we had ever envisioned it to be. We wouldn't hesitate hiring Paul Murphy for any bathroom remodel job! " " About two years ago we had Paul completely remodel the master bath in our 55 year old home. Paul did an excellent job, even offering suggestions, (which we incorporated in our remodel). His work was timely and above standard, the tile is perfect, the floor will not be a problem again, and the tiled shower is picture perfect. We recently had a small leak from the toilet, I called Paul and he came quickly over to repair it, never did we expect such great service after two years! Paul does his work in a very professional and timely manner, he is trustworthy and reliable, and I would recommend him highly to anyone wanting a fantastic bathroom re-do! " 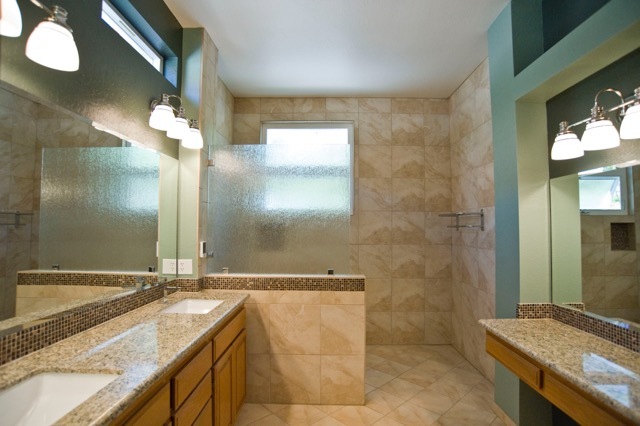 " We are extremely pleased with our bathroom remodeling experience with Paul Murphy. Paul & his assistant, were very friendly, professional and did a great job with our tub to shower conversion. We appreciated Paul's attention to detail at every phase of the remodel and his ability to find solutions to our unique construction problems. The result is a beautiful new bathroom! We highly recommend Murphy's Bathroom Remodeling without any reservations. " " We were really impressed with Paul and his crew. Paul said the job would take two weeks and I asked if it could be finished any faster since it was our only bathroom. He said they would do their best and they were finished three days early - hooray! Also I thought demo would take longer than it did - it only took one day and they did an excellent job protecting the floor and cleaning up every day. Paul reallly made it easy to choose the materials for the job. I showed him a few pictures I liked from his website and he gave me ideas of how to make it work in my bathroom. Two thumbs up! " " Paul - thanks for the great job on my 2 bathrooms. The price was suprising low and the quality of the detail work was right on the first time. The best experience I have had with home remodeling. Every time I had a question I could reach you, even Sunday night. If anyone is looking for a low priced, high quality, great communicator, just call Paul and ask him any questions, any time 7 days. He is very informative wihen it comes to bathroom remodeling and what materials should be used. Best guy with the best price! " " Paul, we can't thank you enough for our 3 new bathrooms. They are so beautiful. You were absolutely great to work with, and all of your colleagues were professional and terrific as well. You came in on time, under budget, and with an end result that exceeded our expectations. We will recommend you to all of our friends and neighbors. Thank you again for transforming our home. " " I contacted Murphy's via email to request an estimate to do a tub to shower conversion. I was contacted immediately by Paul the owner. I told him what I wanted done and he was able (and willing) to give me a "ballpark" figure as to how much the job would cost. We made an appointment for him to come by my home and do an actual estimate for me. He came by and he was pleasant and very professional and we reached an agreement. Work began as agreed and proceeded smoothly and on schedule. The job took exactly as long as he promised, at the agreed price and exceeded my expectations. Paul understood exactly what I wanted done and was very helpful in helping me choose materials needed. He stayed on top of the process and he has good, talented people that work with him. I will definitely use Murphy's again and again for other projects that I am planning around my home. " 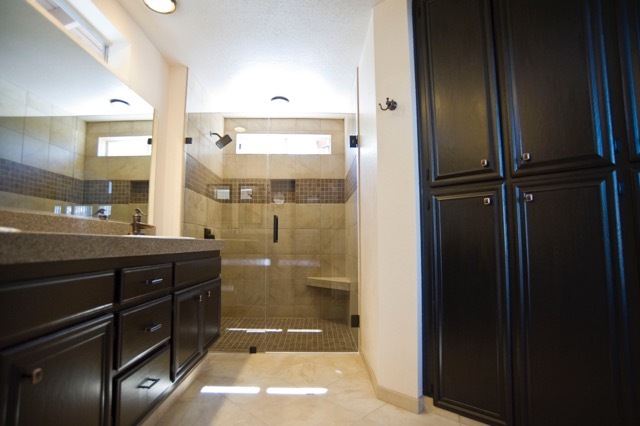 " I recently had my bathroom remodeled by Murphy's Construction and I'm really happy with the results. I had been putting off the remodel for a long time because I was a little overwhelmed by the idea of finding a contractor. Finally I couldn't stand the old bathroom anymore so I started checking yelp and google for contractors. There were many to choose from but most seemed like they only did large, elaborate bathroom and kitchen remodels. I really liked Paul's site because there was such a variety of bathrooms both large and small. I called and Paul gave me an estimate over the phone. After talking with him I felt comfortable choosing his company for the remodel. He came out to confirm the estimate, then he walked me through the whole process, started and finished when he said he would, and kept me updated on everything by phone or email since I was often not home when he was there. Most importantly, my bathroom is beautiful! " 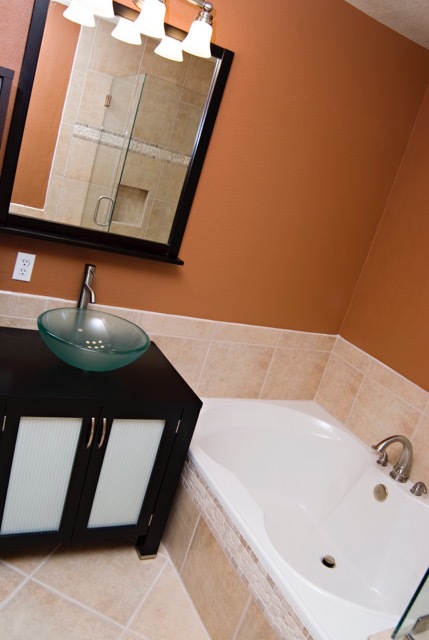 " We just had Paul remodel our bathroom and vanity and it looks great! We had an idea of what we wanted but he helped make it happen by providing recommendations and even came with us to Home Depot when we purchased the wrong materials. From the demo to the tile to the plumbing to the finish we couldn't be more satisfied. Highly recommended. " " I selected Murphy's Construction to remodel my bathroom, and I am very pleased with the results. The remodel included replacing a shower/tub combination with a porcelain tile walk-in shower, replacing a vanity sink with a pedestal sink, replacing the toilet, and installing porcelain floor tile and wainscot. The price that Murphy's Construction quoted me was very reasonable, and the quality of the work was outstanding. Paul Murphy has a great personality, is very reliable, is very knowledgeable. If you are looking for a contractor to remodel your bathroom, this is the company you should go with! " " We were referred to Paul by sone very close (and trusted) friends, and boy are we glad they did! Paul Murphy is the consummate professional. First and foremost, his primary concerns are helping his customers save as much money as they can, as well as ensuring them complete and total satisfaction of his workmanship. He pours his heart and soul into his work, and it shows in the final product. After the tedious process of searching for a contractor to remodel our bathroom, we thankfully decided to have Paul do the job because of what he offered - good, hard, honest work AND the fact that he allowed our dreams to manifest. Other contractors denied our hopes by telling us that some of our desires wouldn’t be possible (due to “special restrictions” according to their “professional opinion”); and their quotes were all outrageously overpriced compared to what Paul informed us he would charge. So in the end he won us over because he helped our dreams become a reality. We would HIGHLY recommend Paul Murphy to do ANY job in your home. You’d be utterly satisfied - we definitely were! "